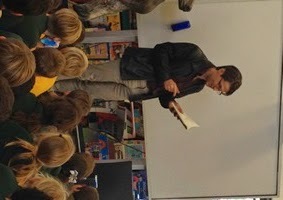 This month we hosted local author George Ivanoff, taking him to visit the Grade 2 & 3 children at two schools in Bayside: St Agnes' Primary School in Highett and Sandringham East Primary School, where he talked about his new "You Choose" series of books. George had an enthusiastic reception with the children as they took great delight in choosing how the story would go as he read extracts to them, as well as talking to them about how writing the "You Choose" series differed from other books he has written. If you would like us to consider your child's school for an author visit feel free to pass on our contact details to your school and encourage them to call us.